On the 27th July, Saturday we went to Jewel Cafe for dinner and it was a pretty nice place to hang out. 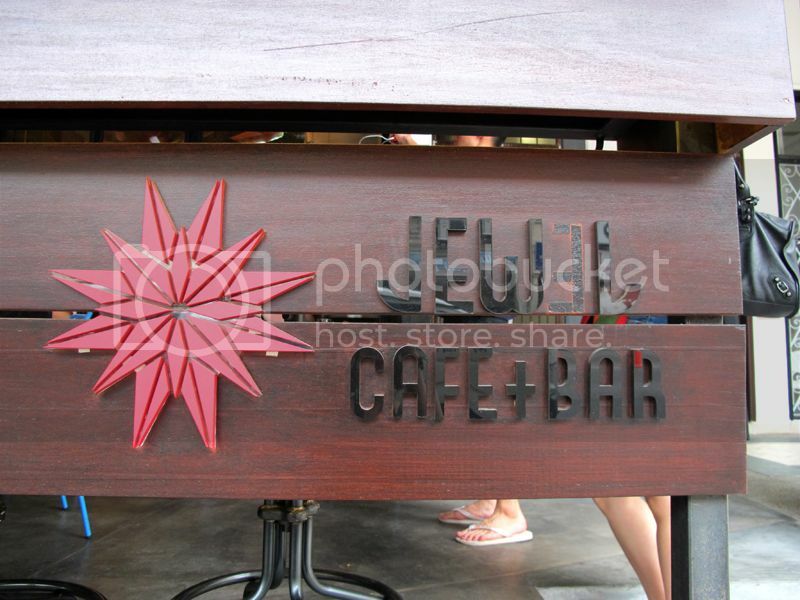 The name of the cafe, Jewel according to the boss means Jesus, it was a direct translation of Jesus in Mandarin. There is this very welcoming air about the place, it felt like we were attracted to here like magnets. As for the furniture it was a blend of the olden and modern days. 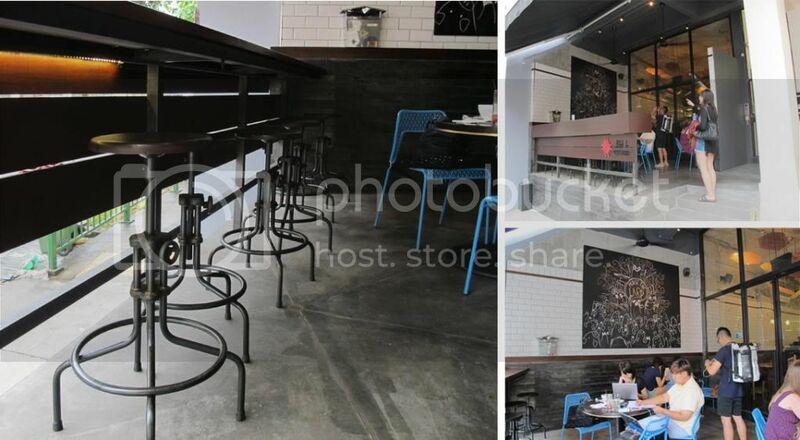 The interior was minimally done up, spacious and well organized. Well lit and yet not disturbing to anyone, even with our curious presence. HAHHAHHAAH! Casper hard at work, just to get a good shot of the Aeroplanes! The second level has a more lounge like feel compare to the first level. 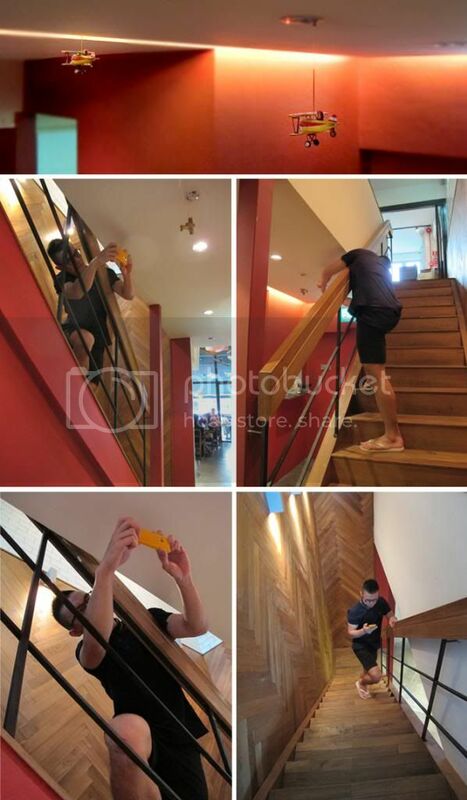 The first floor has this magical feel that will make conversation comes out gradually, where else the second floor. Makes people just want to kick back and enjoy the remaining days. Time felt slower and relax. The interior at the top is slightly different, I would said compared to the bottom. It felt harder, with it raw unfinished textured ceiling and long squarish sofa. But it did it job just fine to make one feel relaxed. And of course, going to a cafe we had to try out their food! and they did not disappoint! our tummies were filled to the brim and it was totally worth the money. 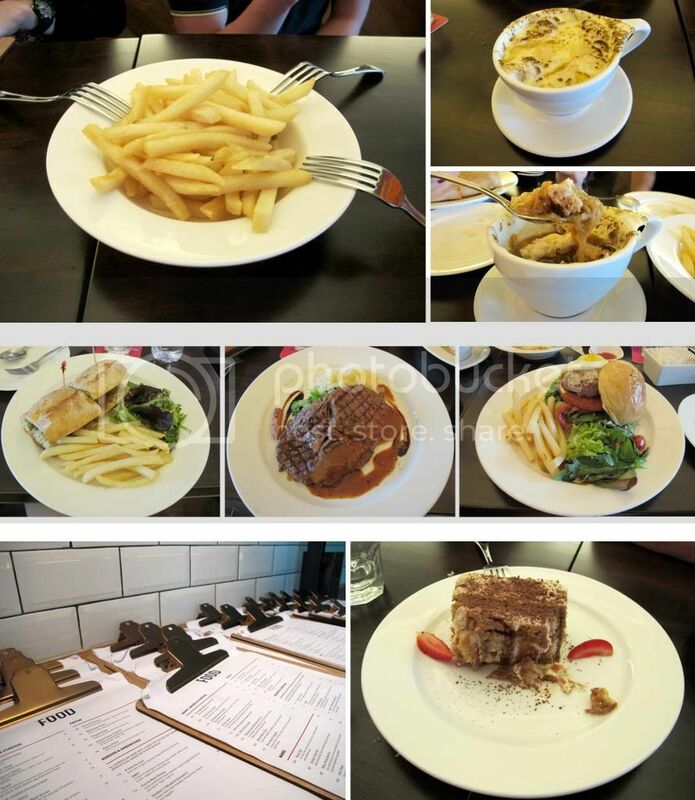 If you guys are planning to make a trip down to Jewel Cafe, do try out their onion soup and OMG burger!! Its that time of the year yet again, where NAFA 3DD students showcase their hard work and craftsmanship in their graduation show. Just last year, it was our graduation show, the time passes by all to quickly. 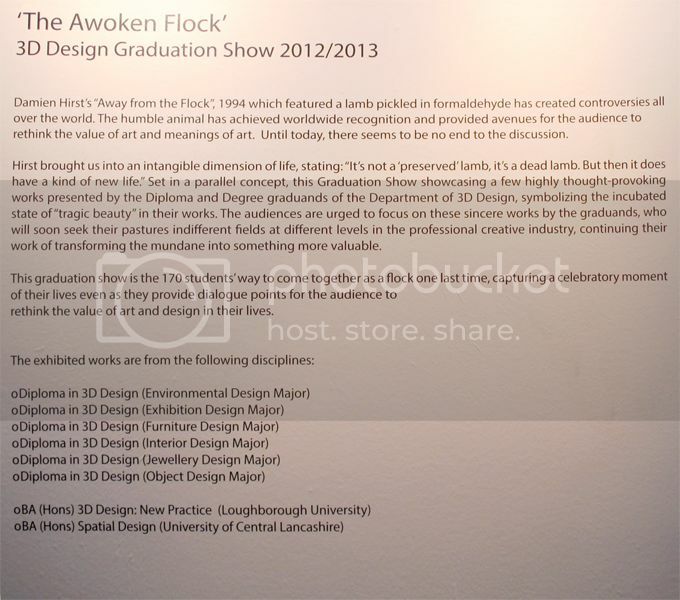 This year's theme of the graduation show is 'The Awoken Flock'. Separated into 2 different galleries, Lim Hak Tai Gallery and Gallery 1 making the flow of space easily accessible and also was able to hold the crowd. 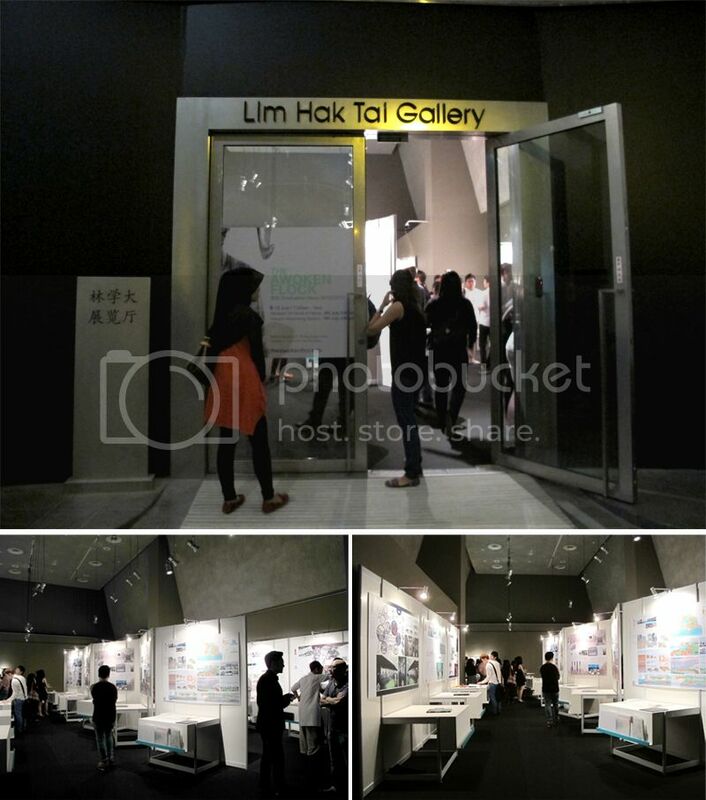 In Lim Hak Tai Gallery, the exhibited works were from the Object Design Major, Jewellery Design Major, BA(Hons) 3D Design: New Practice and BA(Hons) Spatial Design, And in gallery 1, the exhibited works were from the Furniture design major, Interior design major, Exhibition design major and Environmental design major. We decided to walk the less crowded gallery at that time first which was the Lim Hak Tai gallery, where we saw quite alot of interesting designs from the 2nd Batch of Object design student's works! The space of the exhibition seems a bit tight, and we couldn't really see the overall exhibition when we first stepped in. The first booth that we had find it quite unique was Wabi Sabi done by Lee Jin Quan. Making used of the materials Brass and Copper, he had created a set of boxes that were finished by nature itself or by man , the metals became tarnished and wrecked, giving the vessels a different look rather than having that perfect and shiny metal box that we all are so familiar with. The entire series allowed us to appreciate and respect the tenacity of the materials, breaking away from the usual perception that metal has to be clean and shiny. Next work was done by Livia Kurniati. 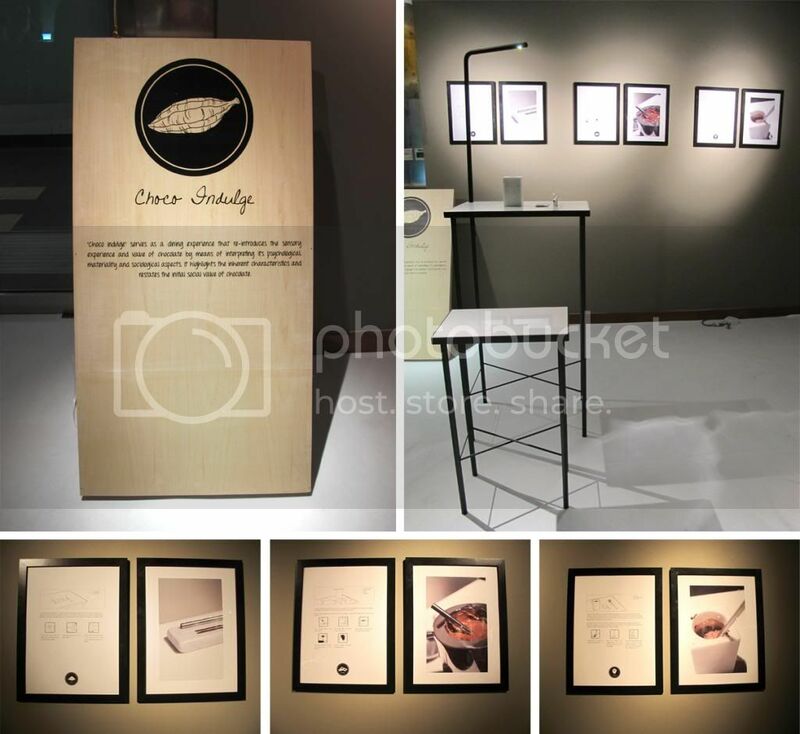 Her project, Stele was based on exploring on water hyacinth as a main material used for the end products. 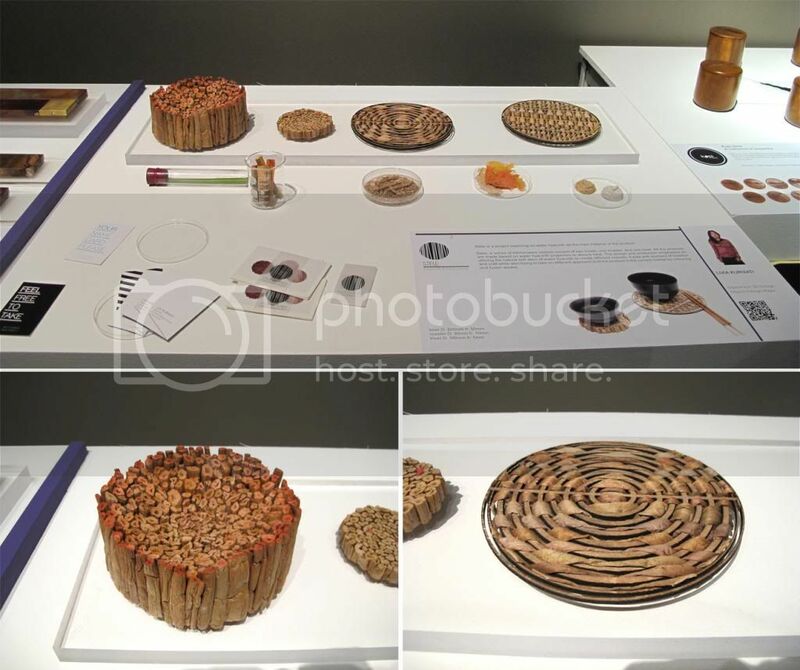 A series of kitchenware that consist of 3 different kinds of coasters and a bowl. These products are made to adsorb heat and designed using traditional pattens such as weaving. Stich with Lovers, a reciprocal wedding favor was designed by Anthony Lee. This idea was something we thought was one of the most commercially thought ideas. As simple as just using acrylic and laser cutting tools, people are able to bring home wedding favors in a simple carrier and yet able to send their wishes back. Maybe people with think oh there is the reception book where people can sign on, but Anthony designed an object that can make it more fun for the guest as well as more touching for the happy couple. The top part of the handle is able to be placed on a stem where when all the guest at the table has done so, it creates a flower like pattern. Moving on, we went over to the 3D New Practice exhibit. there were only about 5 students taking the degree program, but we only 2 of the works caught our eye. 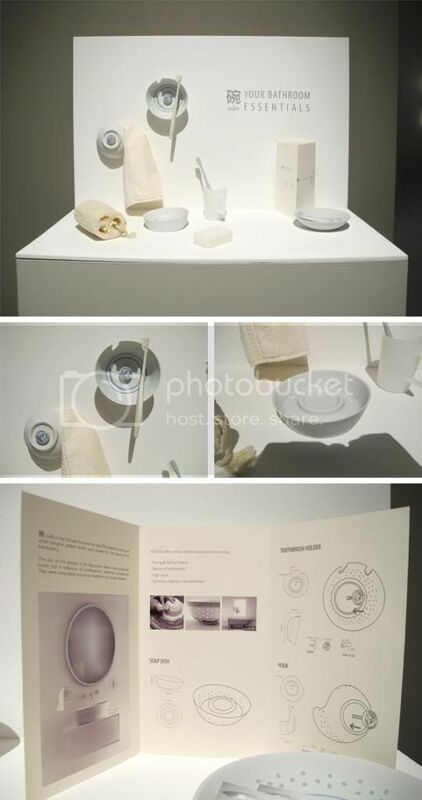 Your Bathroom Essentials by Wong Shun-Hui Elaine recreated the traditional blue and white rice grain pattern bowls into contemporary bathroom accessories. She chose to use the bowl as part of her idea was for its beauty of its translucency. We thought that this was unique as well as making use of traditional bowls that Singaporeans are very familiar with to create something unique and delicate. With the different bumps and dents in a bowl can be useful for a soap dish or a toothbrush holder. 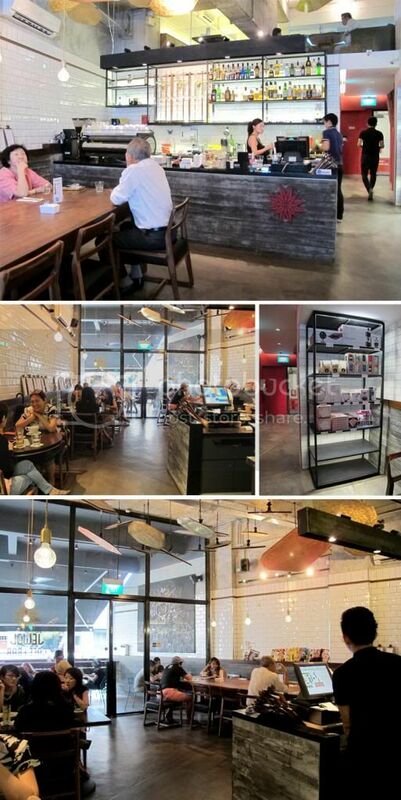 Choco Indulge by Wong Tingren Flynn, a self indulgent, dining experience that allows the diner to be able to get the value of chocolate by using means of interpreting its psychological, materiality and sociological aspects. Using the Marble as the main material, he creates a personal space where a person can enjoy and in a way be in their own world while eating chocolate. What we liked about his works was how simple his products were. They could be placed at any high class restaurant, as it has a certain kind of elegance to his design. Moving on to the other gallery, we took a look at something that we are more familiar with. Furniture Design! The students were given 3 topics to choose from, 1: Materials, 2: Small spaces and 3: Budget furniture. Odette, a modular desk and shelving system designed by Felizia. She choose to design for small spaces. Making use of materials such as wood, metal and corian, these elements are mounted onto the wall with horizontal support, producing a clean and uncluttered feeling of simplicity and lightness in material because of the reduction of the structure to the essential elements. Her design idea came from the ballet bars. 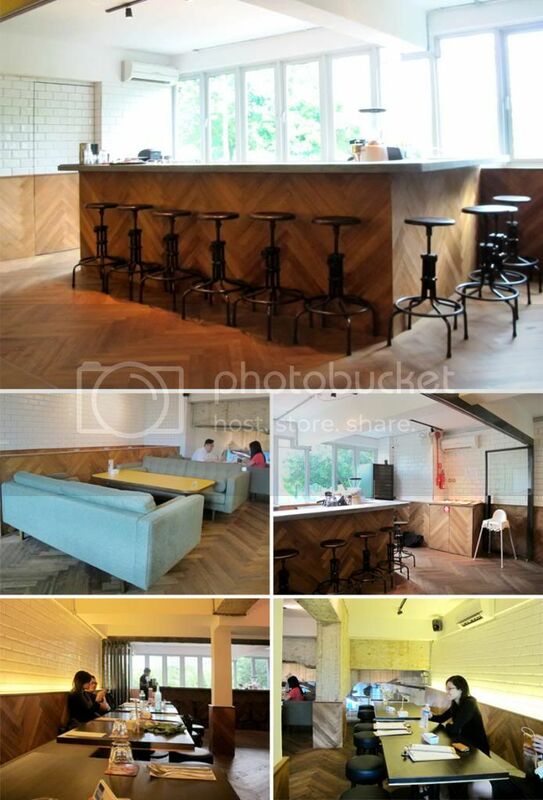 Which also fits nicely into today Singapore's home context of small living space and maximizing possible spaces. Odette allowed multiple combination and configuration that can be use in private, professional and commercial spaces. Another design for space saving was Montura done by Camille. Her idea came from the relationship between a parent and child. 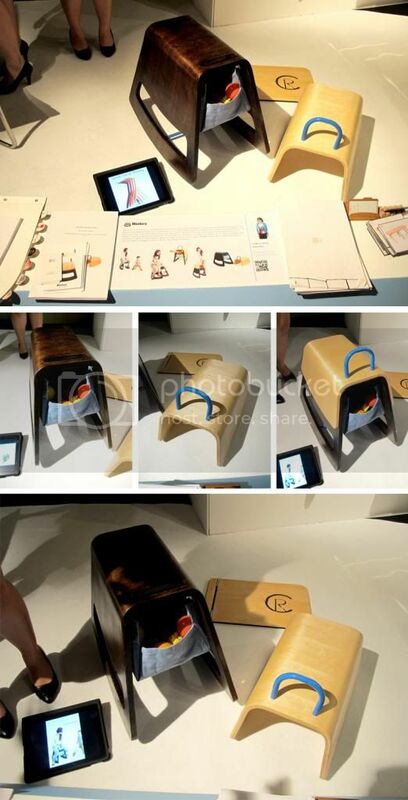 she designed a kind of rocking stool that can be used to store the children's toys under the stool, and has another layer that can be detached for the child, allowing the parent and child both able to play together and It enhances the parent and child's relationship as well. the only thing that we would change from this design is definitely the colors of the furniture. Having it to be something that parents and children would be drawn to, the colors do not stand out enough. One of the works that we found to be really interesting and using an uncommon material was POLy Bench and Lounge Chair by Muhammad Danial Bin Jasmin. Using Styrofoam and Thermoplastic to create furniture not everyone would be able to think about it. But for this designer, he put what was learned from his internship into good use! even though the furniture looks chunky and odd shaped, but it is really light and stable. "it is able to be jumped on, and it wont give way" was what Danial said to us. 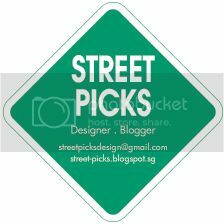 it is really an idea that can be redeveloped and use to make furniture. That is about all for now, till next year's graduation show! Good job to all the Nafa Graduates, may you guys find that school life is so much more fun than in the real world.